Breakthroughs and discoveries need to be economically viable to have a lasting impact on the world. Through this dual-degree program, undergraduate students at the Johns Hopkins Whiting School of Engineering can complete an engineering degree and earn a Master of Business Administration from the Carey Business School within five years. Students pursuing this program begin with their bachelor’s degree courses at the Whiting School of Engineering during years one through three. In year four, students will be fully immersed in the Carey Business School’s full-time Global MBA program and will then complete a summer internship. Year five will cover the remaining course work for degrees at both schools. The five-year time frame for the completion of two degrees offers students a substantial savings of time and money over pursuing the degrees separately. This program is offered through the Whiting School of Engineering and the Carey Business School. Each graduate will receive two degrees, one from each school. With the dual-program structure, students will be able to complete both bachelor’s and master’s degrees in less time than it would take to complete the degrees as separate programs. The Global MBA program requires 54 credits encompassing all aspects of business knowledge and skills in an innovative, interdisciplinary curriculum. Engineering students must apply to the GMBA in year three of their engineering degree studies. GMBA courses will be taken during year four. During the fifth year, students will complete all the requirements for both their undergraduate and MBA degrees. Much of the remaining course work for the GMBA program may be completed in the evening, allowing for daytime attendance at WSE. The fifth-year elective courses offer students the opportunity to specialize in industry-focused areas, such as Enterprise Risk Management and Entrepreneurship. Tuition and fee information for the Whiting School of Engineering programs is available at engineering.jhu.edu. Applicants to the program should refer to the Carey Business School Tuition and Fees chart for current MBA tuition amounts. We offer a variety of financial aid programs, including scholarships, loans, and work study opportunities. Learn more about the financial assistance available to students. The Global MBA/Bachelor's in Engineering is open to undergraduate students at the Johns Hopkins Whiting School of Engineering in their third year of study. The program schedule is particularly advantageous for students in the Applied Mathematics and Statistics program and the Computer Science program, but is open to all students seeking a Bachelor’s in Engineering. Students interested in applying can begin the application by clicking the link below and selecting “Global MBA” on their application. For more information on the program and help applying, please contact Seon Jeon. 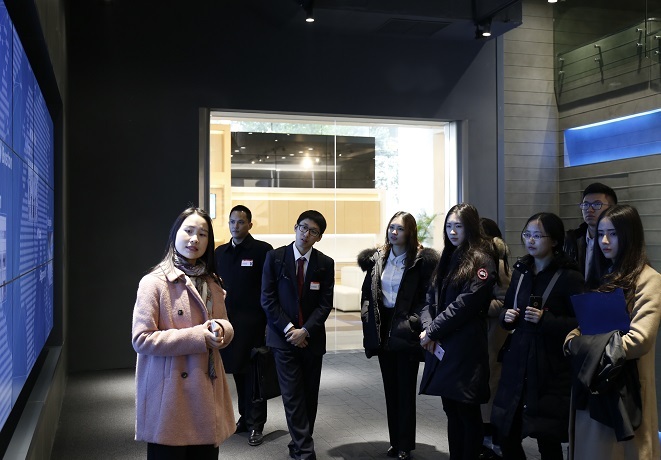 A group of 15 full-time Carey Business School MBA and MS students spent seven days visiting eight international companies in Beijing and Shanghai last month as part of a school-sponsored employer trek.